The cost of installing an air-source heat pump (ASHP), also called mini-split, in your home will vary significantly based on the specifics of your project, including the kind of equipment you select, the layout of your home, and whether any electrical upgrades are required. As a result, MassCEC cannot say what a “good” price is for your air-source heat pump. However, we can help you see what others are paying for air-source heat pumps projects around the Commonwealth. The Qualified Products List includes single-head, multi-head, and central ASHP systems. A single-head ASHP system has one outdoor compressor unit connected to a single indoor conditioning unit. Central ASHP systems condition air at a central location and distribute it throughout the building utilizing a distribution system. Multi-head ASHP systems have one outdoor compressor unit connected to multiple indoor conditioning units. 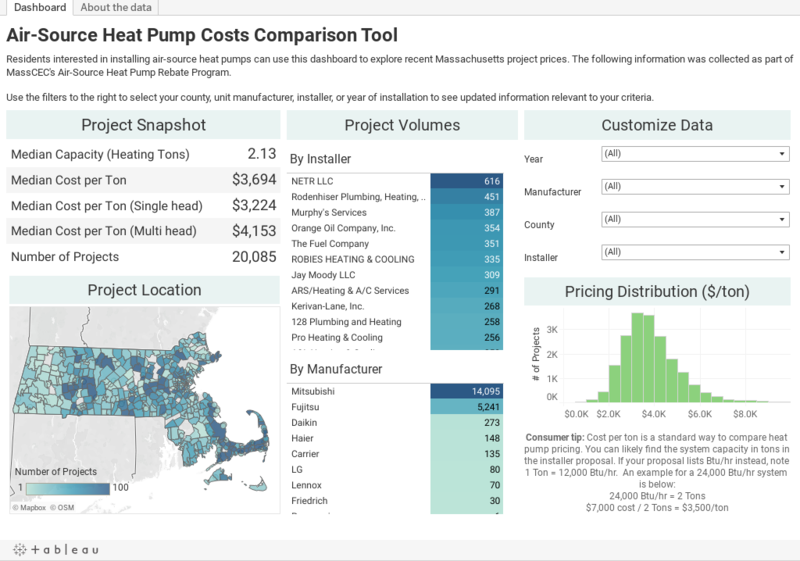 The data below includes residential or small-scale air-source heat pump projects that have received a rebate from MassCEC.